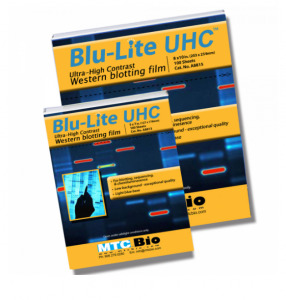 Blu-Lite UHC™ is MTC Bio's newest line of high contrast, high sensitivity autoradiography film. Blu-Lite UHC film is specially formulated for an optimized balance of high sensitivity and low background. This low background, high contrast formula produces a lighter blue film, making it ideal for all autoradiographic and electrophoretic applications. In addition to Blu-Lite UHC's excellent sensitivity and contrast characteristics, it is also coated on both sides (double emulsion) for improved consistency and overall performance. 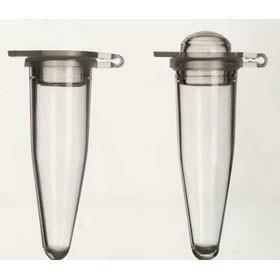 Especially useful with chemiluminescence, BluBlot HS works well with 14C, 32P, 125I, and 35S. This new film reliably produces sharp images which allow for maximum DNA visualization with unsurpassed clarity. Compatible with automatic processors and manual development methods, Blu-Lite compares directly with films costing 3-5 times as much. 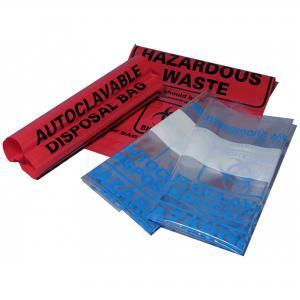 With a shelf life of 2 years from date of production, Blu-Lite UHC is packaged in lined, light-safe dispenser boxes that include an improved "lift off" cover. Film is packaged 100 sheets per box.